The shamanistic duck, just beautiful! I'm enjoying this strip so much!! I have now officially begun enjoying this strip. The past few have been building up quite nicely, and I can safely say I'm liking it. If you scroll, the duckâ€™s aureola seems to flash, it grows bigger and smaller. Groovy! Did she just reach enlightenment…? 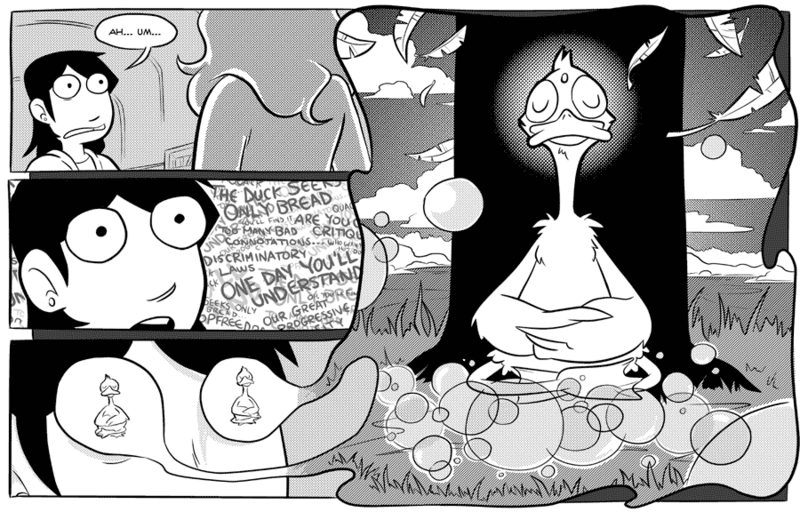 She just ducked right past Nirvana and became fowl with everything. This is inspired by "The Invisibles", isn't it? This has got to be the best online comic! It is, it has been proven by zoologists. How is it that everyone has ducked out of the opportunity to make quacks about this page? *gasp* "Ah um" becomes Aum!